FRANCISCO 'EL BANDIDO' VARGAS SCORES STOPPAGE VICTORY AGAINST 'LIGHTNING' ROD SALKA IN MAIN EVENT OF GOLDEN BOY BOXING ON ESPN AT FANTASY SPRINGS RESORT CASINO IN INDIO, CALIF.
INDIO, CALIF. (April 12, 2018): Francisco "El Bandido" Vargas (25-1-2, 18 KOs), former WBC Super Featherweight World Champion of Mexico City, Mexico, defeated "Lightning" Rod Salka (24-5, 4 KOs) of Bunola, Pa. in the main event of the April 12 edition of Golden Boy Boxing on ESPN and in front of a crowd of 1,456 boxing fans at Fantasy Springs Resort Casino in Indio, Calif. Vargas dropped Salka with a solid combination in the fifth round and forced Salka's corner to call a halt to the fight at the end of the sixth round. "I wanted to put a great show," said Francisco Vargas. "I did what he worked on in the gym, fighting cautiously and moving my head. I feel great because we did a great job. I want the rematch against Miguel Berchelt. We're ready for that fight." In tonight's co-main event, Andrew "El Chango" Cancio (18-4-2, 14 KOs) of Blythe, Calif. defeated the Kazakhstan-born Aidar Sharibayev (7-1, 6 KOs) via technical knockout in the tenth and final round of a bout contested for the vacant WBA Intercontinental Super Featherweight Title. Cancio dropped Sharibayev with a left hook in the third round, and scored another knockdown with a right hand in the fifth round. After dominating for a few more rounds, Cancio stopped Sharibayev at :43 of the tenth round. "I listened to my corner, and I trained hard. That's why I got the victory," said Andrew Cancio. "I threw jabs and combinations, and I kept moving my head. This was a great performance in front of my fans. It feels amazing because hard work pays off." Rommel Caballero (0-0-1) of Coachella, Calif. made his professional debut in tonight's swing bout by fighting to an unfortunate technical draw against Eric Rodriguez (1-2-1) of Los Angeles, Calif. The bout originally scheduled for four rounds in the lightweight division. However, the fight was halted at the end of the first round due to an accidental headbutt, which according to the California rules forces a technical draw decision. "I don't know what to say. It's crazy," said Rommel Caballero. "This is not what I wanted at all. It's the California rules, so I have to respect them." Javier Padilla (6-0-1, 5 KOs) of Indio, Calif. scored a decisive four-round unanimous decision victory against Ricardo Arias (1-3-1) of Mexico City, Mexico in a super featherweight fight. Padilla won with scores of 39-37, 40-36 and 40-36. "I've dedicated myself more to boxing this time around," said Javier Padilla. "That's why I won this rematch. I was working the graveyard shift before heading to the weigh-in for the first fight. But I've quit my job, so I was well rested for this one. I can't wait to be back." Aaron "Silencer" McKenna (3-0, 2 KOs) knocked out Keasen Freeman (4-2, 2 KOs) in the first round a scheduled four-round welterweight fight. After dropping Freeman with a left hook to start the round, McKenna landed a right hand that ended the bout at 2:06 of the same round. "I felt very strong," said Aaron McKenna. "I landed some good, solid shots. After he went down the first time, I knew he couldn't handle my power. I knew I had to start fast but at the same time be patient, and it all came together." Genaro "El Conde" Gamez (8-0, 5 KOs) defeated Japanese pugilist Shoki Sakai (22-8-2, 12 KOs) via unanimous decision over eight rounds of welterweight action. Gamez was victorious with scores of 79-73, 79-73, 77-75. "I felt great, though he [Sakai] was much bigger," said Genaro Gamez. "It was good experienced because he was tough, but at 130 or 135 nobody beats me." Jonathan "Thunder" Navarro (14-0, 7 KOs) of East Los Angeles, Calif. scored a tough eight-round unanimous decision victory against Justin Savi (9-15-1, 6 KOs) of Silver Spring, Md. in a welterweight bout. Navarro won with scores of 80-72, 80-72 and 79-72. "It was a tough fight because he [Savi] can take a punch," said Jonathan Navarro. "I've been staying very busy because I've been finishing my bouts clean and without taking too much punishment. Hopefully, I can take a little break and come back in the summer." 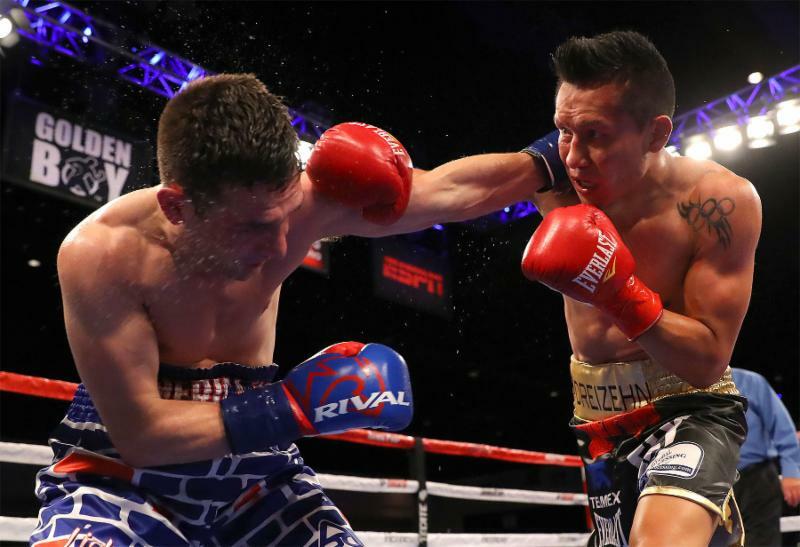 Vargas vs. Salka was a 10-round lightweight fight presented by Golden Boy Promotions. The event was sponsored by Tecate, "THE OFFICIAL BEER OF BOXING" and Hennessy, "Never Stop, Never Settle." The event took place on Thursday, April 12, 2018 at Fantasy Springs Resort Casino in Indio, Calif. Resort Casino box office, by calling 1-800-827-2946, or by purchasing online at www.fantasyspringsresort.com. www.espn.com/boxing; follow on Twitter @GoldenBoyBoxing, @OscarDeLaHoya, @ESPN, and @ESPNBoxeo; become a fan on Facebook atwww.Facebook.com/GoldenBoyBoxing; and follow on Instagram @GoldenBoyBoxing and @OscarDeLaHoya. Follow the conversation using #GBPonESPN. pasting link: http://bit.ly/VargasSalka into a browser. Credit must be given to Golden Boy Promotions for photos and videos used.